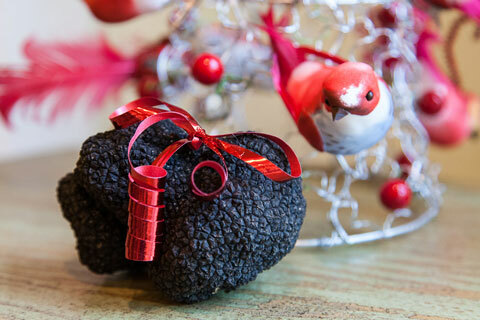 Winter so far: We’ve been busy over the last few weeks, finding truffles and despatching them to satisfied customers. 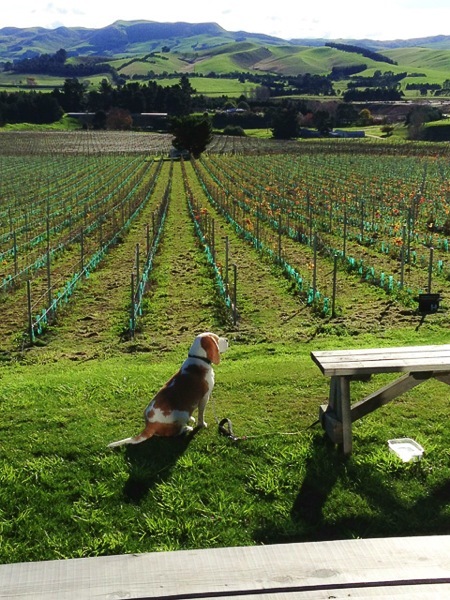 Rosie the trufflehound’s fame has been spreading, thanks to a lovely photoessay at POD Gardening by Paul Thompson which records our discovery back in April of the largest Burgundy truffle yet harvested in New Zealand – all 533g of it. The weather’s been oscillating between snowy cold and unseasonal warmth, but seems to have settled into the latter for the last week or so. It’ll soon be time to get stuck in to pruning vineyard and trees (500+), not to mention the 100+ roses in the garden. 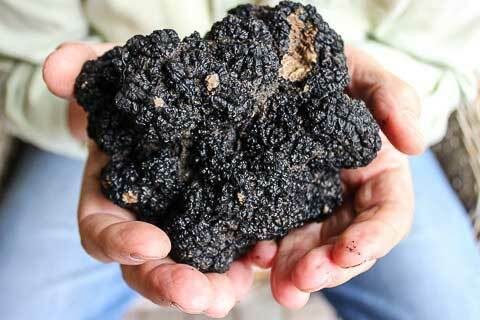 Bianchetto truffles: We’re hoping to start harvesting good ripe truffle very soon, and expect to be able to despatch existing orders in the next week or two. Once again, let us know if you want to add your name to the list. Périgord black truffles: Rosie’s sniffing around on a weekly basis at the moment, but as yet we have no sign of ripe truffle. 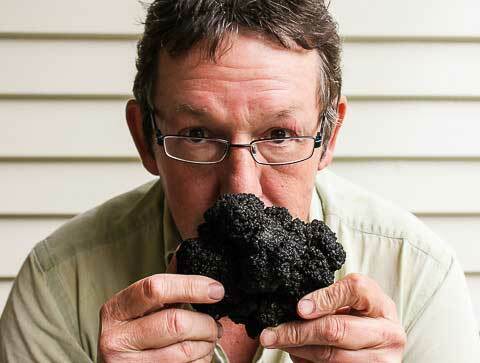 Back in May, I started a Limestone Hills truffle harvest newsletter. I’ve just sent out the fourth in the series – the last for the year. I had intended to parallel post the newsletters to the blog, but for a number of reasons (one of which has been dealt with by moving the Limestone Hills site to a new web host), I never got round to it. This, therefore, is by way of catching up. It was originally mailed out on May 7th. To sign up to our newsletter, fill in the box in the sidebar. The story so far: summer 2013 has been a wonderful time for Burgundy truffles, and our tiny little patch of trees continues to astonish us with its productivity. I blogged about the most recent record-breaking monster – all 533g of it – here, and the earlier 529g big boy featured on our Facebook page and in The Press. 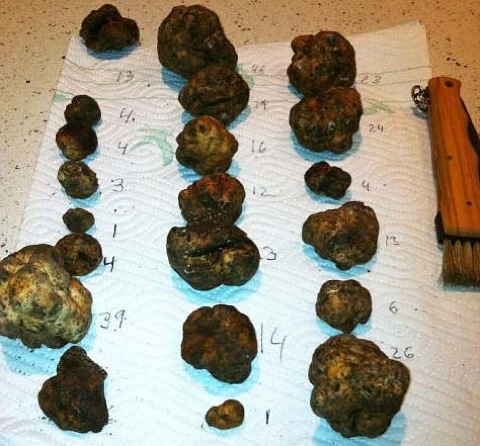 Both truffles were sold to Saggio di Vino, who made excellent use of the beautifully aromatic truffles. Burgundy truffle has also been on the menu at Black Estate in Waipara (excellent truffle butter), and served at Roots in Lyttleton. So far this year we’ve produced nearly 5 kg of truffles, but not all were saleable. We’re still learning about quality control with this species, and we’re not willing to let truffles go if they’re not going to give a good account of themselves when they hit the plate. For Christmas consumption, a Burgundy truffle of a little under 200 grammes unearthed on Christmas Eve at Limestone Hills ((Photographed on Christmas morning, ribbon by C Russell.)). Not really very ripe, but it made a very nice addition to a champagne cream sauce ((Half bottle of fizz, truffle peeled and cut into thick matchsticks, bubbled together until reduced by half, then cream stirred in and simmered until thick enough to coat the back of a spoon, poured over the cooked cray meat at the point of serving.)) for the enormous crayfish ((aka lobster, but without the big front claws.)) we enjoyed for a light lunch. Probably the first fresh Burgundy truffle ((Technically, Tuber aestivum syn uncinatum, known as the Burgundy truffle in Burgundy (! 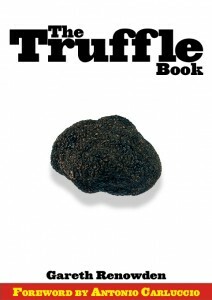 ), or the summer truffle in Britain.)) to be eaten at Christmas in New Zealand. There are five more in the ground, and I’m waiting to see how long they’ll take to ripen properly — or if they do so at all. It’s supposed to be an autumn to early winter-fruiting truffle, after all. In the meantime, the compliments of the season to all. 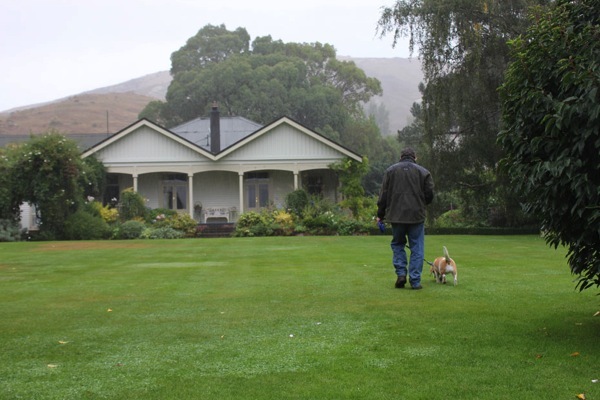 Marcel and Sherwyn at the Bell Hill vineyard near Waikari have joined the ranks of NZ’s white truffle growers, thanks to the exploratory efforts of Rosie the truffle machine. I took her over the hill yesterday for a sniff round the trees — Bell Hill have Burgundy, bianchetto and Perigord black trees, as we do at Limestone Hills ((From the same nursery batches, too.)). I thought the bianchetto block looked promising, with lots of rabbit interest round the trees, and after a slow start Rosie got into her stride, finding a beautiful large bianchetto close to an oak. The look on Marcel’s face is not one I shall ever forget – big grin, bright eyes, extreme pleasure writ large. Unfortunately, a couple of minutes later I was laid low by a Menières episode ((Never pleasant, and I’m very grateful to Marcel and Sherwyn for getting me home safely. 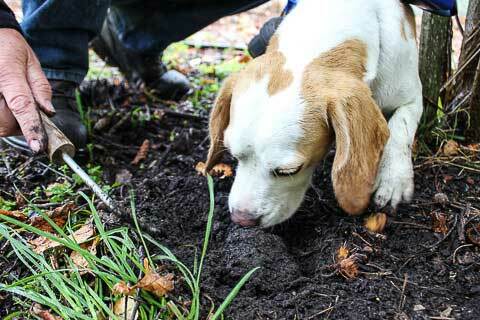 )), but Rosie kept going with Marcel, eventually finding around 300 grammes of good truffle (see above). I’ll be back at Bell Hill later in the week to see if their Perigord black truffle trees have also started fruiting — but I’m not guaranteeing success. Having spoken to local growers, it looks as though this is not a good season for the Perigord black — at least in Canterbury. Last summer was cool — and perhaps too cool for a good harvest. At Limestone Hills we’re well down on last year, though the remarkable productivity of out little bianchetto block, and the excitement of finding our first Burgundy truffles, including one of 330 grammes, has helped to keep our spirits ((And sales.)) high. It was an outstanding meal and a great evening. The Burgundy truffle ice-cream was magnificent, and the sous-vide potatoes with their truffley buttery unctuousness were superb, but every course was a triumph in its own way. We’re looking forward to repeating the exercise next year in Jonny’s new restaurant, and perhaps making it an annual event. Our truffles have also been featuring on the menu at Amberley’s excellent Nor’wester Café for the last month, and I’ve spent a couple of Saturday mornings at the Waipara Valley farmers market selling truffle. Meanwhile, Jonny has just collected a consignment of bianchetto for a lunch he’s cooking for the editors of all NZ’s food magazines this week. Small, but perfectly formed — that’s our harvest. You could say the same for Limestone Hills in almost every way. Limestone Hills is now built on WordPress, and the blog has given up its “blog” subdomain to find a home in the main site. Over the next week or two, I’ll be installing a small web store to handle sales of books (physical and digital), using Paypal to handle credit card processing rather than the manual process I’ve been using up to now. The empty home page and all the others will be populated with text and pictures, and there will be a lot of tweaking of sidebars and gadgets until I’m happy with the way it looks. The Aviator will be launched in August, and already has its own Facebook page, plus a brand new blog ((Three blogs I’m running. I must be mad.)) which will record events in The Burning World. On The Farm will be for truffles, food, wine, farm, family and musing, and over at Hot Topic I’ll continue covering climate science and policy news as humanity sets about delivering a burning world for all our tomorrows. In other web-related news, the Limestone Hills Facebook page has been seeing good traffic this truffle season, and is worth a follow if you want to know what we’re up to. Now, where did I put that glass of wine? For the two and a half people who come here with some sort of regularity: big news. I have finished the second draft of my next book, a work of speculative fiction ((Which I usually describe as a science fiction comedy adventure satire. Others might prefer cli-fi, or climate fiction.)) with the working title of Lemmy, or Around The World By Airship. Since I announced the project over two years ago, I have been setting and missing any number of deadlines for its completion. The last few weeks have been spent rejigging and restructuring the book based on a preliminary read-through by my editor, the estimable Lorain Day. It’s been a bit like doing a cross between a jigsaw puzzle and a crossword puzzle, trying to make a Jackson Pollock into a Van Gogh, and now I leave the text — all 112,594 words of it — to Lorain’s tender mercies. 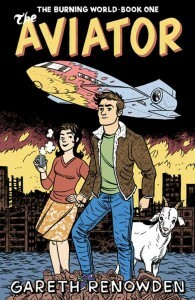 A copy of the draft is also in the hands of the artist who will do the cover, the very wonderful Dylan Horrocks, who has, I think, only agreed to do it because there are airships involved ((Specifically, a very hi-tech and intelligent airship.)). With luck and a following wind, I hope to publish Lemmy in a couple of months. It will be an ebook, available worldwide through Amazon for Kindles, and through everyone else for iPads, Kobos, Nooks, Sony Readers, iPhones and the rest. Or you’ll be able to buy it direct from me, if I can finally work out how to install a little web store on this site. Paper copies of Lemmy will be available soon after through print on demand services. More on the publication plans as they firm up over the next few weeks.